One of the largest branches; we serve: Johnsonville, Newlands, Paparangi, Grenada Village, Broadmeadows, and Churton Park. We average around 3500 customers per week. 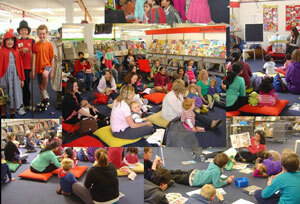 Many pre-school and primary children use our Library. Johnsonville has a large shopping centre, a swimming pool, and a medical centre. It is also home to a community centre, an Employment Service agency and an Income Support office. We are close to the city; (10 minute drive) and there are good bus and train services to and from the community. The first library in Johnsonville opened in 1890 but did not survive. The second opened in 1941. Books were rejected donations from Wellington Library. Johnsonville Borough Council amalgamated with Wellington City Council in 1953. The second Library was closed and the Mobile Library was introduced. In 1965 a proper branch library in Johnsonville was established. In the first year of operation; 100,000 items were issued. An extension in 1980 doubled the size of the library, and council pensioner flats were added upstairs, at the back of the library. Apart from offering library services, customers can also buy WCC rubbish bags, recycling bags, daily or monthly parking coupons and recycling bins. The library is a pick-up and drop-off point for housebound items also, whereby library items are collected by a designated person; for elderly or incapacitated borrowers. We have computers offering free access to pre-selected internet sites, but if you want to use the internet for email or other general searching, we have several computers available for $1.50 for 15 minutes, $3 for half an hour and $6 for an hour plus 20 cents per page printing charge. If you do not use all of your time during a session at the computer, you can use up the remaining minutes at any WCL branch within the code's validity (usually 30 days). Our free internet service provides free access to websites we think are useful for information or research. These include websites such as online newspapers, government websites, some NZ websites, the websites recommended in our kids catalogues and many more. Johnsonville Library is currently trialling free wireless internet. Just bring in your wireless-compatible device and ask a team member for the current password. Wifi will be available from 10.00am and will disconnect at 5.25pm, Monday to Saturday. Free word processing is available from our computers and printing costs 20 cents per page. Software available includes: Microsoft Word, Microsoft Excel, Microsoft PowerPoint and Adobe Reader 6.0. CD and memory sticks (USB devices) are available for purchasing. Our photocopier provides both A4 (20 cents per copy) and A3 (40 cents) copies. It is coin-box operated, but we are able to give change at the front desk. ZoomText software is available to use on one of our public computers located on the newspaper area of the library. ZoomText enlarges font size on webpages and electronic documents (email, newspaper databases etc) and can be set to read these aloud or display in high contrast large print. Ask at the front desk and a librarian will show you the ZoomText computer. The Text and Photo Magnifier enlarges the text and photos in reading materials up to 58 times its normal size. Ask at the front desk and a librarian will assist you on how to use the Text and Photo Magnifier . We have a fax machine available. There is a $4 base charge to send faxes, plus per page charges for national and international faxes ($1.50 per page for national faxes, $6 per page for international faxes), and a $5 flat rate to receive faxes. Johnsonville Library offers a range of fun and inspiring programmes and events for children including Baby Rock & Rhyme, Preschool Storytime, school visits and holiday activities. For more information about these programmes please visit the Johnsonville Library what's on page. The Johnsonville Library collection offers a range of different material including fiction, non-fiction, children's and young adult collections, large print books, bestsellers, magazines, audio books, audiovisual collections, Maori collection, adult learning (ESOL), comics, maps, reference material, and online databases. We also have a Chinese collection and some foreign magazines like Grishoba and the Taiwan Panorama. The library holds four (4) week's worth of copies of the Dominion Post and the New Zealand Herald. In addition to these newspapers, we also have many Wellington City Council publications and various local news and information sources available. The Māori branch name for Johnsonville is Waitohi. The Waitohi stream is the old name of the Nga Uranga stream. Find out more on our Māori branch names page.